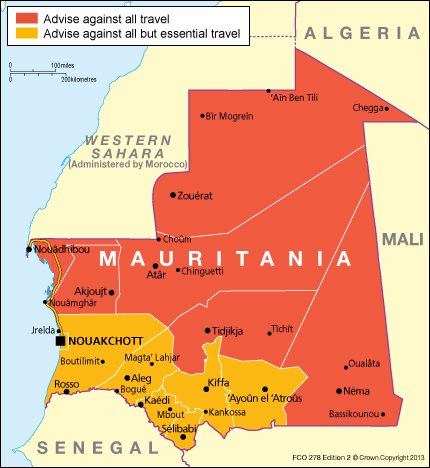 However the travel advisories indicate that the areas to avoid are north Mali (ok, the first two options do so) and northern Mauritania, which currently has an advisory for no travel at all. This is obviously a problem as both the first two options (the preferable ones) proceed through this area. First-hand reports tend to indicate actual travel through the area is ok, as long as it's at day only and you stay at population centres. There doesn't seem to currently be negative reports on the Mauritania-Mali border after the ceasation of the French push through northern Mali, nor are these borders listed as currently closed, but proceeding through Senegal is probably the safer option anyway. As Annoyed mentioned in the comments, Mauritania has shut a lot of border crossings currently (2014) due to Ebola. That includes all crossings into Mali, but also all into Senegal other than those at Rosso and Diama. The second route through Senegal is still potentially open because it crosses the border at Rosso. Not the answer you're looking for? Browse other questions tagged road-trips morocco mali or ask your own question. Is it possible to cross the border from Morocco to Algeria? Crossing border from Spain to Morocco - possible problems?